China and Russia are sure to prevent any sanctions or arms embargoes against Myanmar. 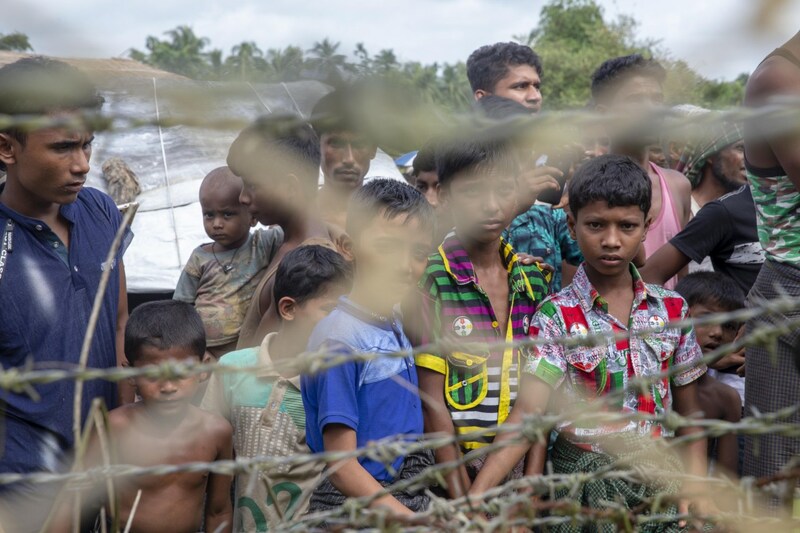 Rohingya refugees gather near the fence in the “no man’s land” zone between Myanmar and Bangladesh border as seen from Maungdaw, Rakhine state during a government-organized visit for journalists on August 24, 2018. Phyo Hein Kyaw/AFP//Getty Images. 25 Oct 2018 – Over a year after the government of Myanmar started its brutal crackdown against the Muslim minority Rohingya, the killings are continuing. It took the U.N. months to even call the massacres “ethnic cleansing” before a horrific mountain of evidence compelled it to use the more serious (and criminal) term for what’s happening: A genocide. More: One year and 10,000 Rohingya deaths later, UN accuses Myanmar of ‘genocide’ – The United Nations is calling out Myanmar’s military for its horrific, sustained crackdown on the country’s Muslim minority. China, with the support of Russia, tried to stop the U.N. briefing from happening at all. Myanmar has strong business ties with China, which has repeatedly voiced its support for Myanmar. Since August 2017, when Rohingya insurgents launched a deadly attack on border police posts, the military has unleashed an unrelenting campaign of violence that has seen thousands of Rohingya killed, hundreds of their villages burned, and over 700,000 fleeing to neighboring Bangladesh, where they live in refugee camps. Survivors have spoken of being starved, raped, and watching their families — including children — shot, hacked, or burned to death. Prior this campaign, some 1.1 million Rohingya lived in Buddhist-majority Myanmar, where they had virtually no rights and no freedom of movement. They are often referred to as “Bengalis” and aren’t even named by officials there, who claim they don’t exist as a ethnicity. In other words, returning Rohingya before there is any kind of process to ensure their safety and their basic human rights would only serve to give Myanmar the license to finish the job. More: Facebook finally takes action in Myanmar, 10 months after genocidal crackdown began – Since October, Facebook has been consistently accused of doing nothing to help stop hate speech against the minority group. The U.N. inquiry’s report called for an arms embargo on and sanctions against Myanmar, as well as creating a tribunal to try suspects or forward them to the International Criminal Court. China and Russia will likely veto any attempt at sanctions and arms embargoes.